“Last year, the Huawei P20 series started a revolution in static photos and managed to retain the number one spot on the DxOMark leaderboard for a year. Today, the Huawei P30 series will play a vital role in changing consumer’s expectations towards smartphone photography,” says Matthew Ng, deputy country manager, Consumer Business Group, Huawei Malaysia, during the Malaysian launch on April 2. The devices are certainly built to shatter smartphone camera expectations. 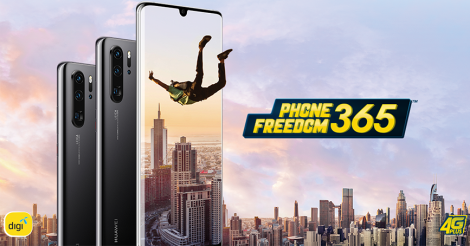 The P30 Pro variant is equipped with a Leica Quad Camera System, comprised of a 40MP main camera with the Huawei SuperSpectrum Sensor, a 20MP ultra-wide angle camera, an 8MP telephoto camera and the Huawei ToF (Time of Flight) Camera. The telephoto camera in particular supports high-fidelity magnification of 5X optical zoom, 10X optical zoom and up to 50X zoom. How it fits into the slim chassis is thanks to a periscope design, which uses a prism element in the telephoto camera that bends light at a 90-degree angle, which maximises focal length while minimising height. To dive a little deeper into the cameras’ specs, the main 40MP SuperSpectrum sensor features OIS (optical image stabilisation) an f/1.6 aperture and a 27mm equivalent lens. The SuperSpectrum refers to the sensor’s redesign from RGB to RYYB, which allows it to absorb more green and red light before it’s changed back into RGB data. This translates to better low-light performance. The Huawei P30 series is comprised of two variants – the P30 and the P30 Pro. They have several similarities – both are powered by a Kirin 980 octa-core processor and have 8GB of RAM, for instance – but differ significantly in most areas. For one, the P30 Pro comes with a 6.47-inch FHD+ (2340 x 1080) Curved OLED display while the P30’s is smaller (6.1-inches) and non-curved. The Pro version is equipped with a 4,200mAh battery versus the P30’s 3,650mAh. Additionally, the P30 Pro sports the Huawei Wireless Quick Charge, while the regular P30 will have to make do with a Wireless Charging Back Cover. The differences are most apparent in the camera department. The P30 Pro features the aforementioned Leica Quad Camera System, while the P30 has a Leica Triple Camera setup, missing out on the ToF Camera. The P30, with 8GB RAM + 128GB of ROM storage, prices at US$661 (RM2,699). As for the P30 Pro, the 8GB+256GB ROM version prices at US$931 (RM3,799), while the 8GB+512GB model is available for US$1,078 (RM4,399). Those who followed the P30 series’ Paris launch will note that there is a Huawei P30 with a 6GB+128GB setup as well as a P30 Pro with 8GB+128GB. According to Luke Au, GTM director, Consumer Business Group, Huawei Malaysia, those versions will not be available in Malaysia, but he doesn’t rule out possibilities of them arriving at a later date. The smartphones come in Breathing Crystal, Aurora and Black designs. Huawei’s launch event also saw the launching of the Huawei MateBook 13 laptop, which will also be available on April 6. Featuring a 3:2 FullView Display (boasting screen-to-body ratio of nearly 90% and 2K resolution), the 13-inch notebook is equipped with the Huawei Share 3.0 with OneHop technology, which allows the transfer of content between Windows and Android devices with a single tap. The Huawei MateBook 13 laptop runs on 8th Gen Intel Core processors. The i5 model, which has 8GB of RAM and 256GB of SSD storage, prices at US$980 (RM3,999). The i7 model with 8GB RAM and 512GB SDD storage is priced at US$1,078 (RM4,399). April 6 will also see the availability of the revamped Huawei Watch GT line, now available in two editions. The 46mm Edition is fitted with a 1.39-inch AMOLED HD colour touchscreen with a resolution of 454 x 454 resolution and prices at US$220 (RM899). The 42mm Edition, with its 1.2-inch AMOLED HD touchscreen with 390 x 390 resolution, prices at US$196 (RM799).